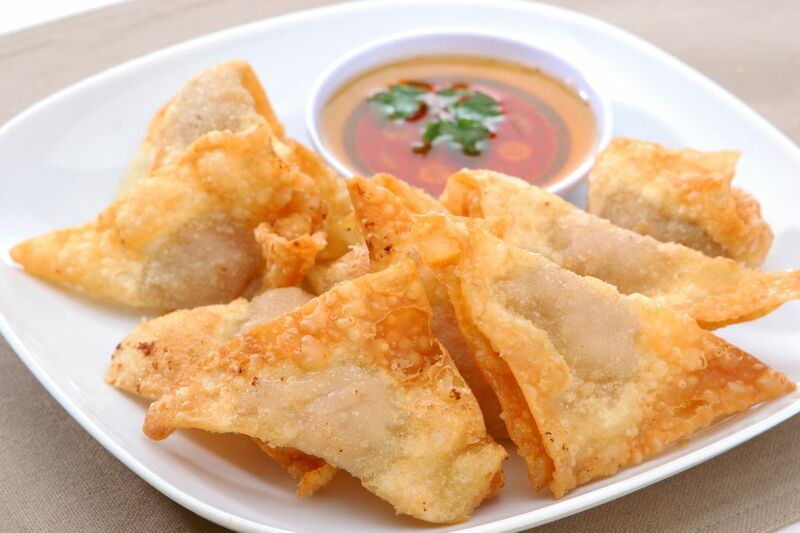 These fried wontons are the perfect party food. Make some and watch them disappear - fast! They're easy and fun to put together and can also be made vegetarian/vegan so everyone can enjoy them. Choose between a shrimp or tofu-onion filling; either one is ready to use in just minutes. Serve with either sweet chili sauce (available in supermarkets), or traditional sweet and sour sauce. If you're expecting company, these fried wontons can be made ahead of time and kept in the refrigerator, then just fried up when guests arrive. Either way, your party is sure to be a hit this crunchy-good finger food around. Enjoy! Drain tofu and slice into very small cubes to equal 1 cup. Thaw and drain if using frozen shrimp. Place in a bowl and add the green onion, hoisin, and sugar, stirring to combine. Using a cutting board or another clean surface, lay out 6 wonton wrappers at a time. You will also need 1/2 cup water and a pastry brush if you have one (otherwise you can use your fingers). Wet the outside borders of each wrapper. Place a little filling (about 3/4 teaspoons) in the center of each wrapper. Fold wrapper in half to create a triangle with the filling inside its base. Press sides together. You can fry them up like this or continue folding by bringing the two outside corners of the triangle together, overlapping them a little and securing with a little water. They should be able to stand up, like artfully folded serviettes. Place oil in a small to medium frying pan (oil should be at least 3/4- to 1-inch deep). Turn heat to high and don't leave the stove. Wait until you see squiggly lines forming on the bottom of the pan. Shortly after this, test the readiness of the oil by dipping the corner of a wrapper into the oil. If it begins to fry, oil is hot enough; if not, wait a minute longer. Place wontons in the hot oil and fry, turning until all sides are light golden brown. Remove from heat and set on a paper towel or clean kitchen towel to drain. Continue until all the wontons are fried. Serve with your choice of homemade Thai sweet chili sauce, store-bought Thai chili sauce, or sweet and sour sauce. If you're expecting a crowd, you can double the filling recipe and still have plenty of wrappers.